Australia's oldest man has spent a lot of his days knitting sweaters for little penguins. Alfred 'Alfie' Date spoke to 9 Stories about how his inability to say 'no' to favours got him into making the miniature animal clothes. The jerseys were requested from Victoria's Phillip Island Penguin Foundation in 2013, to assist the survival of little penguins after an oil spill. Little penguins are a species of penguin only found in southern Australia and New Zealand, with a lone colony of 32,000 remaining on Phillip Island. The 109-year-old, who lives in a retirement home on the New South Wales Central Coast, was asked by two nurses to help make the sweaters, as they had heard he was an experienced knitter. It was a request he could not refuse. Using heavy wool provided by the nurses, Alfie put his 80 years of knitting skills to good use and got to work. The self-taught knitter, who refined his skills after making a baby jacket for his nephew in the 1930s, has seven children and 20 grandchildren, and "about the same amount" of great grandchildren. According to a profile on The Daily Telegraph in 2014, Alfie remembers the sinking of the Titanic in 1912 and the declaration of World War one. He told the newspaper his secret to a long life is simply "waking up every morning." Donations of the knitted penguin outfits were received from all over the world. The foundation says this "is not a fashion statement" but instead they help the little creatures if they are affected by an oil spill. Oil can make their feathers stick together, allowing water to get to their inner layers. This causes the little penguins to get cold and not be able to hunt due to heaviness. When oiled penguins arrive at the foundation, they are given a jacket to wear so that they don't consume the toxins or preen their feathers. 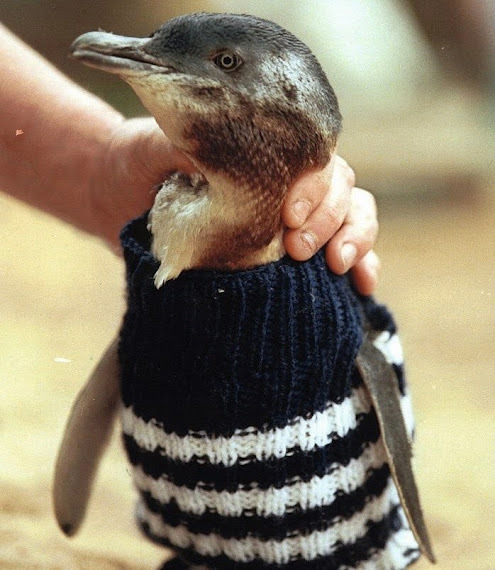 In 2001, 438 penguins were affected in an oil spill at Phillip Island and by using the knitted outfits, 96% of the penguins were rehabilitated at the clinic, according to the foundation's website. The centre currently has "plenty of penguin jumpers (sweaters) at this time donated by generous knitters across the globe" and has asked for no more donations from eager knitters.